I LOVE this eyeliner. It stays put with 3 seconds of applying; however, I sure wonder why they can't offer it in a multitude of colors, particularly TAUPE, which is flattering to all eye colors & and age groups. This seems to be a common complaint in reviews, which seemingly is never addressed by Eyeko. I absolutely love this liner. I received it in my Ipsy bag and had to purchase it. Goes on great. Super smooth application and stays on all day. Love how pigmented it is, hate how after an hour it starts to smudge and wear off makes me upset! Other than that amazing pigment. I just want to start off by saying I never write reviews for anything. 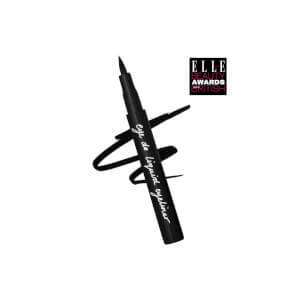 With that being said, this is hands down the best liquid eyeliner I have ever used... and I have used a lot! I have a hard time applying liquid eyeliner, either the brush is too soft so it goes all over or I can't get it to come out on my eyelid. Definitely give this liner a try, you will not be disappointed. It’s a great eyeliner, but it is NOT waterproof. I got this eyeliner in an Ipsy bag and love how dark and precise it is, but If it gets wet, it runs! Love this product ,but I'm 51 right now so i want the same results just softer look, so please make it in BROWN?!? 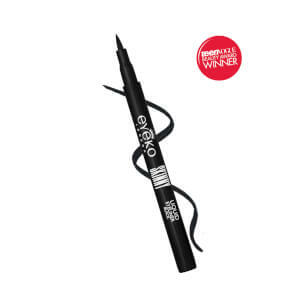 I am basically inept when it comes to eyeliner but this one evens the playing field! 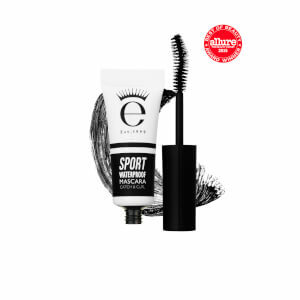 Big bonus it has ingredients that improve your eyelashes!!! What's not to love???!!! I will keep buying as long as it is available! LOVE IT! I did some research on eyeliners, and after reading reviews on this one, I thought I would give it a try, and I was not disappointed at all! I usually try a couple times until I get the desired results, but the tip really gives you a lot of precision, and I was able to get good results on my first try, which is very rare. Also loved the strong black color, but I'm not so sure on it being waterproof . I found it very easy to remove it, without the need for makeup remover, but that's not a problem for me. Would definitely buy again! I received a mini size of this eyeliner in an Ipsy bag and it quickly became my favourite eyeliner. 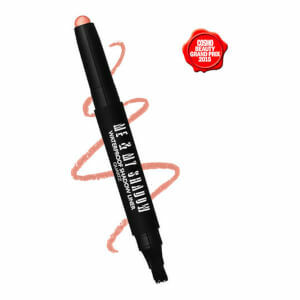 It's waterproof, it doesn't smudge, it doesn't flake, and it's also easy to apply. I bought myself a full size when I ran out and it is still the only liquid eyeliner I use almost two years later. I tried so hard to love this eyeliner. I got a small sample sized pen in my Ipsy bag, and started using it when I ran out of my normal eyeliner pen. I found it very difficult to control compared similar pens I've used, it wasn't very pigmented, and when I tried to do two layers for a better color payoff, the first layer would rub right off and ball up. The first day I wore it was at the dentist, and the hygienist accidentally sprayed me in the face (lol). This "waterproof" eyeliner ran all over. I tried again another day, and despite not sweating at all, being inside where it was cool all day, it transferred all over my lower lashline somehow, as well as my upper eyelid (my eyes are partially hooded). The third day I tried using tape to have a sharper, more fool-proof line, but it still bled everywhere within a few hours, and I had a smeary, blunt cat eye and a lower lash transfer line a third day in a row. All three attempts I wore eye primer and sheer matte eyeshadow. Will probably not be purchasing this product ever.